Whatever view you hold of Gabriela Ngirmang as a peace activist (unheard of in Palau) or a Mirair (traditional title), a matriarch of Ikelau clan, she has made a lasting impression. Acclaimed as “valiant” in the Pacific Women’s Conference in Guam (1989) for her successful defense of Palau’s nuclear-free constitution, she features in a textbook for students of government as “a woman having political efficacy,” vital for democracy. Gabriela believes politics is important not just for the powerful few but for everyone. Yet she never claims to be, or to have done, anything extraordinary. In 1979, Palau’s Constitutional Convention wrote the world’s first nuclear-free constitution, voted upon by 92 percent of Palauan electorate. Gabriela attended one of the convention’s proceedings in which a telegram from the US Ambassador came telling the Convention to drop the “harmful substances” clause because it was inconsistent with the Compact of Free Association with the US. It was that day that Gabriela decided she had to rise up in defense of the nuclear-free constitution. Gabriela’s traditional role as a matriarch in Ikelau clan obliged her to step in and protect Palau’s land from being taken over by the US military as set forth in the compact. She felt it her responsibility to ensure future generations of Palauans would live in a nuclear-free land and waters. She says: “In Palau, women play a very important role in issues of policy. Women traditionally own and devise land. We control the clan money. We traditionally select our chiefs; women place and remove them. Having observed their upbringing closely, we are able to decide which men have the talent to represent our interests. From birth, Palauan women are responsible for the men. When men marry, the women arrange for the settlement, and when they die, women bury them. Women are caretakers of the environment.” Gabriela feels a caretaker of the environment should not get paid because it is a duty to ensure the inherent right of future generations to live in a nuclear-free land and waters and to live in harmony with nature. 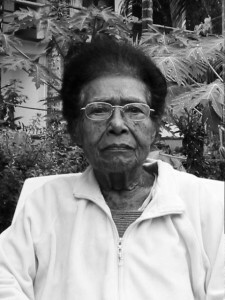 What proved to be most difficult in her struggle was to gain unity among the Palauan people to resist the US military demands set forth in the compact. The economic benefits offered by the United States in the compact made Palauans forget their role as caretakers of the environment.